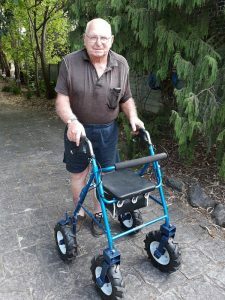 Stoney Ground for Pig Farmer - TADSA - Technology for Ageing and Disability (SA) Inc.
A Pig farmer who relies on his 4 wheel walker was having trouble walking around his farm because the ground is quite stoney in parts & can be very muddy when it is wet. We were asked to come up with a solution for him. Lager inflatable wheels were suggested, but the client said they would be no good because they would get punctured by the 3 corner jacks that he has on his property. 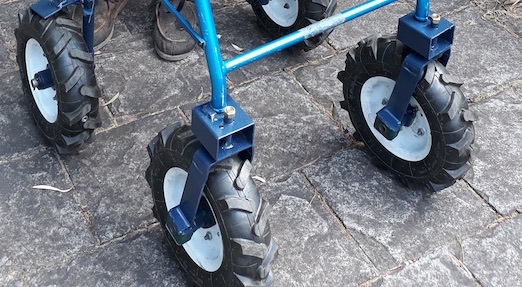 So John came up with a solution by fitting very nobbly inflatable tyred wheels which were much bigger & wider than the standard wheels. The client is now able to more easily walk around his property & not have to worry about getting flat tyres from the 3 corner jacks.